Andrew Wyeth: America’s Preeminent Artist | Skinner Inc.
Andrew Wyeth was an iconic figure in American painting of the 20th century. Son and student of famed illustrator N.C. Wyeth, the young man seemed destined to follow his father’s footsteps yet developed his own individual style. His father’s illustrations took as subjects active figures and colorful places from around the word, while Andrew Wyeth found artistic inspiration in friends and family and his immediate surroundings of Chadds Ford, Pennsylvania, and Port Clyde, Maine. Andrew Wyeth’s contemplative landscapes, portraits, and still lifes, rendered with delicate realism and underlying abstraction, become metaphors for memory, nostalgia, and loss.His palette, too, was more subdued, choosing the subtle shades of nature rather than the vibrant colors of his father. 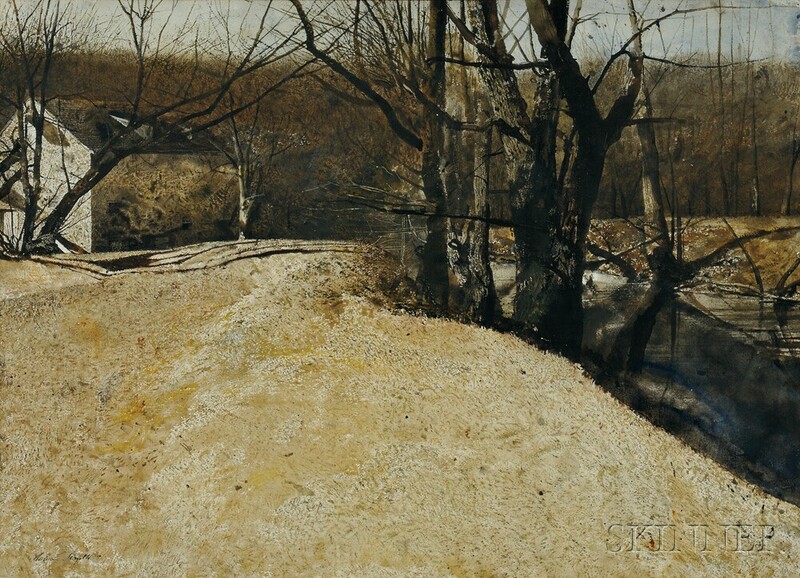 However, for Wyeth technique was never an end in itself, nor was realism. He is quoted, “You can have all the technique in the world and can paint the object, but that doesn’t mean you get down to the juice of it all. It’s what’s inside you, the way you translate the object – and that’s pure emotion.” Writing for Artnews in 1950, Elaine de Kooning described Andrew Wyeth as a “master of the magic-realist technique.” Without “tricks of technique, sentiment or obvious symbolism,” she wrote, “Wyeth, through his use of perspective, can make a prosperous farmhouse kitchen, or a rolling pasture as bleak and haunting as a train whistle in the night.” That same year, Wyeth was lauded, along with Jackson Pollock, in Time and ARTnews, as one of the greatest American artists. 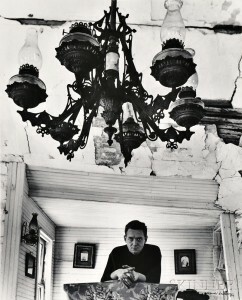 In Wyeth’s obituary in the New York Times (January 16, 2009), Michael Kimmelman recounted the story that, in response to a 1977 survey in Art News magazine about the most underrated and overrated artists of the century, art historian Robert Rosenblum nominated Andrew Wyeth for both categories. Come see Andrew Wyeth’s painting Corn and Grist, amongst other works by notable American & European artists, during auction previews on Wednesday, September 21 from 12-5PM; Thursday, September 22 from 12-8PM; and Friday, September 23 from 9-10AM. This entry was posted in Blog and tagged American art, American artist, American painter, Andrew Newell Wyeth, Andrew Wyeth, art auction, boston, Boston arts, boston auction, Christinas World, fine art, N.C. Wyeth, painter, painting, skinner, skinner auctions by Elizabeth Haff. Bookmark the permalink.